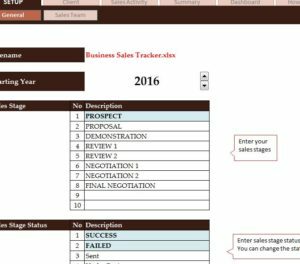 Tracking your sales has never been easier than with the free Business Sales Tracker. If you’re in charge of daily operations or running your own business, then you know how difficult it can be to manage your clients and the number of sales your team is making across the board. There’s just too much data for one person to remember. This free document gives you the freedom to organize all this information, from client info to the stages of your selling system so you can focus on landing bigger and better clients in the long-run. If you’re ready to start organizing your client information and your strategies for sales, then read the guide below. To download this fully comprehensive document, click the link at the bottom of this page. You will want to begin in the “Setup” tab below. This is where you can enter the current date, the stages of a sale, the status terms you want to use throughout the document, sources, and much more. Go through this page and enter the information listed. Now, you can see a whole row of different tabs in which to enter client information and sales strategies. Start by creating a running list of all your clients in the “Clients Lists”. You can then start a list of all your sales employees in the “Sales Employees” tab below. In this section, you can list their ID, sales number, department, and position. The Client Summary puts all the client data in a simple format and for a complete overview of all your information, you can go to the dashboard tab to see the top sales and clients, and the specific amounts for these sales as well. You will also notice that there are multiple “Sales” tabs. This is just so you can group clients together if a single employee is taking care of them. This template makes your life and business so much easier.